Hey guys! Laura here. Being a restaurant blogger is a lot of fun – that is – when your camera battery doesn’t die in your purse on the way to the restaurant. 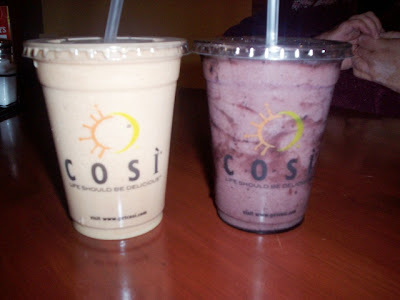 At 3:30 p.m. on Saturday, November 6, Mom and I decided to try Cosi in Wareham. We had heard great things about this place from the Phantom Gourmet, and couldn’t wait to taste the delicious homemade flatbread sandwiches for ourselves. After I placed the order and met Mom at one of Cosi’s less-than-comfortable booths, I reached for my camera to get a shot of the interior. Fail. The battery was completely dead and the camera was in the “on” position. Oops. “I guess we’ll have to come back,” said Mom. Luckily for us, that became something we couldn’t wait to do. It gets dark so early now! 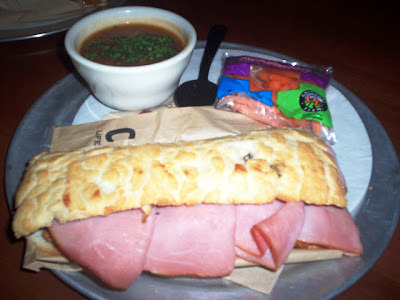 Our second attempt at a Cosi review was on Monday. Since the restaurant is a part of Wareham Crossing, an extraordinarily large shopping center, we were lucky to find a parking spot right next to the door. It was 5 p.m., so the restaurant was fairly empty as the lunch crowd had already gone home and the dinner folks were just leaving the office. On the car ride to Wareham, Mom and I were discussing what we wanted to get. There are so many sandwich, soup, salad, and pizza options here that our heads were spinning. I had about five different meals in mind before I finally settled on something. Mom chose a table this time while I went up to the counter and placed our order. On both visits, we were given a number to put on our table to assist the Cosi staff in figuring out who ordered what – a clever idea. Also on both visits, our food arrived very quickly on metal pizzas pans and was served piping hot. VISIT NUMBER ONE: Mom ordered the ham and brie sandwich ($6.39) on whole grain flatbread with a side of Cosi kettle-cooked chips. She also chose a side tomato basil soup ($1.99) and a medium Arctic Mocha drink ($3.59). I chose the chicken tinga sandwich ($6.79) on whole grain flatbread with a side of baby carrots. I also chose a side soup – spinach and artichoke Florentine ($1.99) – and a medium Arctic Mocha ($3.59). After our meal, we decided to split Cosi’s famous bread pudding ($1.99), which arrived hot and topped with whipped cream. Our grand total came to $27.97. As far as taste goes, everything was out of this world. Mom loved her smoky ham and said that the brie was melted and soft, giving the sandwich a strong flavor. The crispy flatbread was great because it held everything together nicely without overwhelming the sandwich. My chicken tinga was comprised of pulled chicken, crumbled feta, guacamole, pico de gallo, and cilantro in a chipotle-tomato sauce. I definitely needed that sturdy flatbread to keep my sandwich together. The flavors were fantastic and the chicken was cooked beautifully. Both of our soups were very tasty and had three crunchy croutons sitting on top. The vegetables used in the soups were fresh and the creamy bases were thick and warming. The chips and carrots were a nice touch, and the Arctic Mocha drinks tasted like chocolate milkshakes – which was just fine with us. Last but not least, the bread pudding came in a large bowl and had just been heated in the microwave. It was topped with a large dollop of whipped cream and was dense, chewy, and dripping with caramel sauce. Cosi uses their famous flatbread to make the bread pudding, which is why it tasted so good. 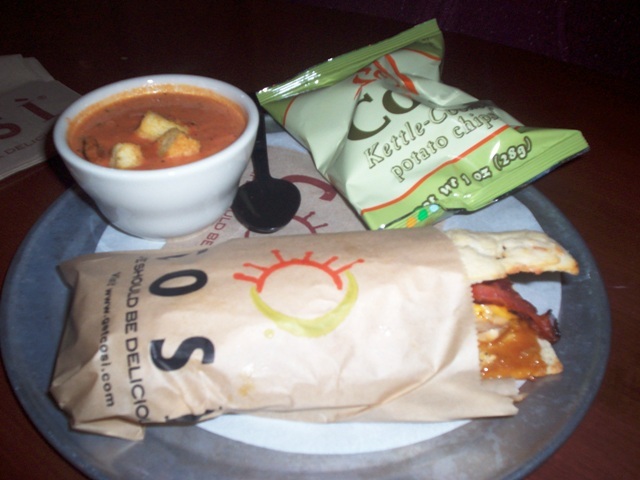 This time around, Mom ordered the bacon, turkey & cheddar melt ($6.89) with no tomatoes on rustic (white) flatbread, a side of Cosi chips, and a side tomato basil soup ($1.99). Since she loved it so much the first time, she got another medium Arctic Mocha to drink ($3.59). I went with something that I saw online in their seasonal sandwich section – the ham & yam melt ($6.79) on rustic flatbread. I chose a side of baby carrots and the Monday side soup – roasted beef and vegetable ($1.99). For my drink, I went with the medium blueberry pomegranate smoothie ($3.49). As we sat and waited for our meal, we were able to check out the décor. Cosi is a very welcoming restaurant with a lot of living room-like furniture scattered throughout (couches, poofy chairs, coffee tables) that gives guests the option to eat in private or at the counter by the window. It has Wi-Fi capabilities, which we saw being used by a group of annoying businessmen with Bluetooths (Blueteeth?). 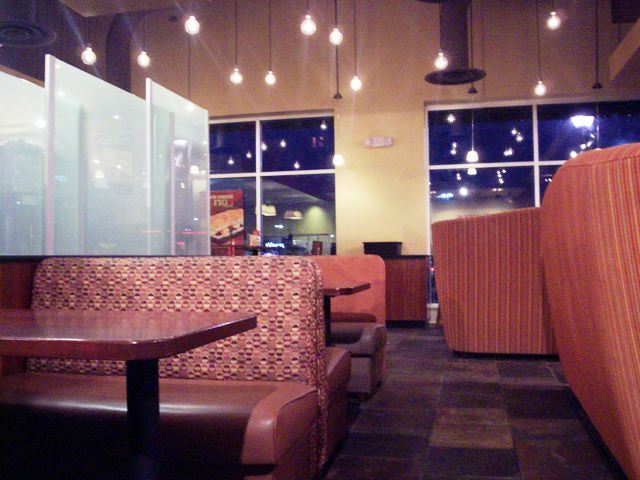 Cosi provides a colorful, yet relaxing environment that helps you refuel after a busy day of shopping in the plaza. Mom’s bacon, turkey & cheddar melt was fantastic. It had large strips of smoky bacon, real pieces of turkey breast, and a thick layer of cheddar cheese with spicy honey mustard spread. She said that the turkey – which was cooked perfectly – was the standout flavor along with a hint of honey mustard. The bacon was meaty rather than crisp, and the melted cheese kept the sandwich together in the tasty rustic flatbread. Again, the Arctic Mocha, Cosi chips, and tomato basil soup were terrific. My ham & yam melt, which had a tamarind balsamic glaze, was both sweet and savory. The soft, smoky ham and the sweet, crunchy yams played off of each other while the glaze gave everything a slight tang. I thought that the yams were going to be hard to keep inside the flatbread, but I was wrong. They were cut a certain way so that they were able to stay put with every bite. This was definitely a great way to start November, and I can’t wait to return to try another of Cosi’s seasonal specialties. My soup was very hearty and had big chunks of beef, potato, and mushroom, while my blueberry pomegranate smoothie – almost black in color – had a lot of delicious fruit flavor. Talk about suggestive eating! Mom and I had noticed a couple at a nearby table eating – or should I say not eating – a delicious-looking pizza. It was served on a little pizza paddle and was just adorable. I don’t know what they were doing, but they ended up taking the pizza home with them in a take-out box. “What’s their problem,” asked Mom. “If I had that pizza, I would have eaten it.” “Me, too,” I said. Then we just stared at each other and started laughing. We knew that we both wanted pizza. “The cheese pizza sounds good,” said Mom. “We could always get it as an appetizer.” “But we already ate,” I said. Apparently, an appetizer can be eaten before or after the meal – according to us, that is. Being a pig, I went up to the counter and ordered a small cheese pizza ($6.99) on a traditional crust (you can also get it on thin crust). After all, when are we going to be here again? We might as well try what we can, right? Right! The individual cheese pizza on traditional crust. The pizza arrived quickly and had a strong tomato smell. It was cut into eight small squares and was covered in melted cheese. The sauce was extremely fresh and chunky while the cheese was gooey and tasty. 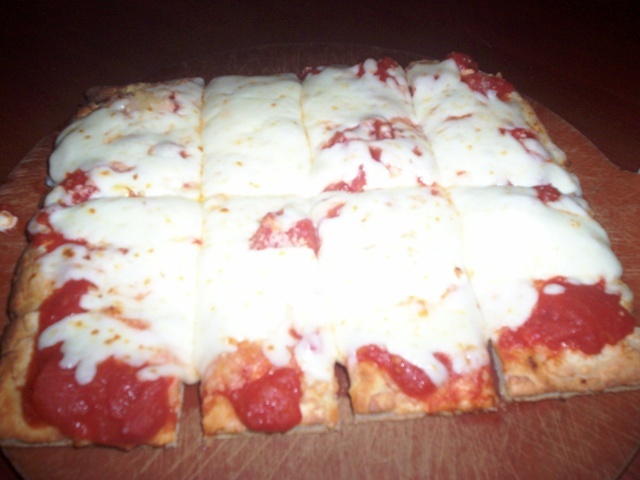 The traditional flatbread crust was puffy but not overwhelming, and had a hearty texture. It was a fabulous way to start end our meal. If you haven’t been to Cosi yet, you need to drop what you’re doing and head there immediately. 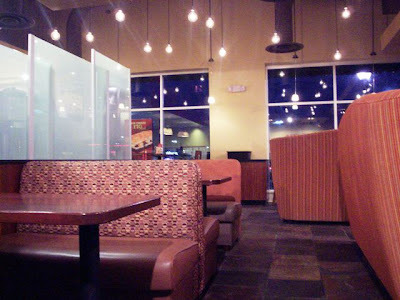 The food is delicious, the staff is friendly, the restaurant and restrooms are clean, and the food is delicious. Did I mention that the food is delicious? 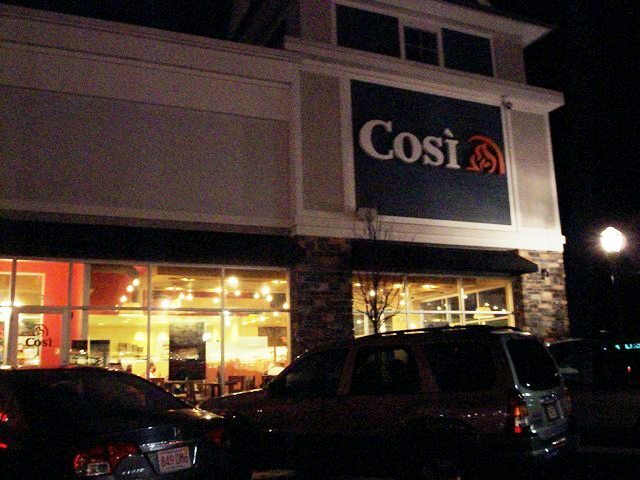 The Cosi in Wareham is located at 2421 Cranberry Highway, Suite 335 at Wareham Crossing. For more information, call (508) 295-1035 or visit the Web site at GetCosi.com. This location is open from 7 a.m. to 9 p.m. Sunday through Thursday, and 7 a.m. to 10 p.m. Friday and Saturday.